‘Take care the nuns don’t start converting you,’ said Waddington, with his malicious little smile. Pia was a gentlewoman of Siena whose husband, suspecting her of adultery and afraid on account of her family to put her to death, took her down to his castle in the Maremma the noxious vapors of which he was confident would do the trick; but she took so long to die that he grew impatient and had her thrown out of the window. I knew basically where we were going, then, in this story that begins, brilliantly, with the suspenseful trying of the door behind which Kitty Fane and her lover, Charlie Townsend, are anxiously concealed. I didn’t know at first, though, that Kitty is so dreadful — self-centered, shallow, vacuous — that I wouldn’t feel sorry for her as her doom drew nearer. He grew perhaps a little more silent, but he had always been silent at home, and no one in his family noticed a change in him. His daughters had never looked upon him as anything but a source of income; it had always seemed perfectly natural that he should lead a dog’s life in order to provide them with borad and lodging, clothes holidays, and money for odds and ends; and now, understanding that through his fault money was less plentiful, the indifference they had felt for him was tinged with an exasperated contempt. It never occurred to them to ask themselves what were the feelings of the subdued little man who went out early in the morning and came home at night only in time to dress for dinner. Having met Kitty, watched her marry Walter Fane for all the wrong reasons, and seen the poor return she makes him for his devotion (“Now that she had learned something of passion it diverted her to play lightly, like a harpist, running his fingers across the strings of his harp, on his affections. She laughed when she saw how she bewildered and confused him”) I came bck to her affair with no sympathy to spare, and I watched without pity as she was coerced by her husband and abandoned by her unworthy lover. A trip into the heart of cholera seemed no more than she deserved, and if she were to go out a window — well, that would be horrible, of course, but not wholly undeserved! It was as though the corner of a curtain were lifted for a moment, and she caught a glimpse of a world rich with a color and significance she had not dreamt of. It seemed not merely to be made visible by the all-discovering sun but rather to rise out of nothing at the touch of a magic wand. It towered, the stronghold of a cruel and barbaric race, over the river. But the magician who built worked swiftly and now a fragment of colored wall crowned the bastion; in a moment, out of the mist, looming vastly and touched here and there by a yellow ray of sun, there was seen a cluster of green and yellow roofs. Huge they seemed and you could make out no pattern; the order, if order there was, escaped you; wayward and extravagant, but of an unimaginable richness. This was no fortress, nor a temple, but the magic palace of some emperor of the gods where no man might enter. It was too airy, fantastic, and insubstantial to be the work of human hands; it was the fabric of a dream. The tears ran down Kitty’s face and she gazed, her hands clasped to her breast and her mouth, for she was breathless, open a little. She had never felt so light of heart and it seemed to her as though her body were a shell that lay at her feet and she pure spirit. Here was Beauty. She took it in as the believer takes in his mouth the wafer which is God. As I said, she gets better. But that was the point at which (for all that I loved Maugham’s writing) things got rather worse for me, as once again I found myself confronting a conversion that (religious or not) was only barely convincing. It’s not that I don’t believe someone like Kitty could transform so completely, though it was a bit like watching Rosamond Vincy rush off to help Dorothea with her plans for healthier cottages — or, even more astonishing, to help Lydgate nurse fever patients at the hospital. The change just seemed undermotivated in the action and unprepared for in her character: we knew nothing about her, up to that moment with the temple, that suggested any capacity for reverence, awe, or duty. If Rosamond had changed in such a way, we would have understood fully how such a thing was possible, just as we understand, thanks to Chapter XV, how Lydgate’s troubles arise from his “spots of commonness.” The before and after with Kitty were not just radically different: to me they seemed almost unconnected, and I found that jarring. to me the account of Sophie’s religious experience was a reedy echo (at best) of Maggie Tulliver’s struggles with faith in The Mill on the Floss, where her passionate embrace of asceticism after reading Thomas à Kempis emerges from a rich narrative context including overt philosophical reflection on the needs religion meets for those who are suffering inexplicably. By comparison, What Happened to Sophie Wilder is briskly superficial about the social and historical contexts of both Charlie’s and Sophie’s stories. Perhaps that’s because George Eliot thinks religious belief needs explanation, while Beha is emphasizing its spontaneity and inexplicability. The black box of mysticism forestalls any urge I might have to disagree with or even interrogate Sophie Wilder’s beliefs; they just are. And, being that she converts to Roman Catholicism and takes on the full dogma of that religion, I already know what those beliefs are—and, again, they just are. What she believes may make no sense to me, but her actions do, because they predictably follow from her beliefs—and I never have to walk through any attempts at nonmystical moral logicking with her that might rankle or irritate. 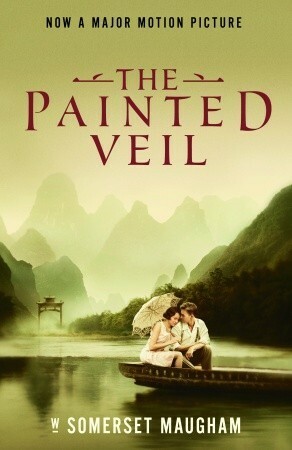 Once again, with The Painted Veil, I find myself wondering if I am the problem: I don’t — I can’t — share the character’s transformative belief, which to me is just a form of magical thinking or superstition, and that so without the kind of explanation Eliot offers (which translates their religious impulses into secular ones I can understand) I’m just not invited to the party — or into the mysterious garden. Whatever its specific causes, I was glad that, home again, Kitty offered her father the love and sympathy he’d never known before: “She saw dimly all the suffering that had preyed on his heart for thirty years.” Her resolution to bring her daughter up differently — “to be a person, independent of others because she is possessed of herself” — also casts a somewhat different light back on Kitty’s earlier behavior. “I never had a chance,” she says, but she faces the future with “hope and courage.” It’s not the defenestration I’d initially hoped for, but I admit, it’s a better ending for us all.